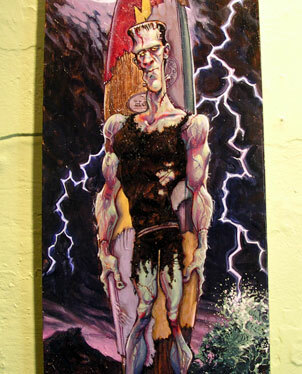 "Hula Girl Zombie," by Len Peralta, is one of the Halloween-themed works on display at Chinatown Boardroom in "Memoirs of a Monster," on exhibit through Nov. 3. Halloween is Jackie Walden's favorite holiday. And the co-owner of Chinatown Boardroom found that her fondness was shared by many an artist friend, so she got a bunch of them together to brainstorm an exhibit to celebrate. The result is "Memoirs of a Monster," a "portrait-literary" group show that presents artwork of spooky characters complete with biographies. The exhibit runs through Nov. 3. Story lines are often humorous, the perfect accompaniment to mostly playful images. 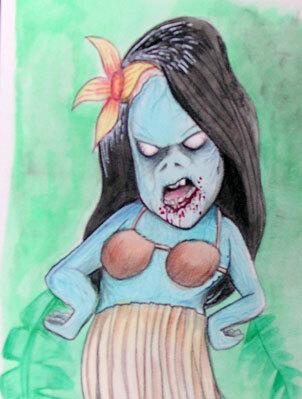 The write-up for "Zombie Hula Girl," by Len Peralta, for instance, goes like this: "In the distance/ A silhouette appears/ Hips moving to the mele/ Her sweet hula draws you near/ But as you get closer/ Lust turns to fear/ Heavy is the stench of salt air/ She turns to face you/ Blind dead eyes and revenant hair/ Extending rotting hula hands/ Flashing her smile/ So doomed and coy/ You try to run but/ She's already eating your brains/ With a side of poi." "Flat Black Magic," by Rich Richardson. Walden says some of the artists were so excited about doing a Halloween show that they had their artwork planned months prior. All that enthusiasm paid off. "I love the show," Walden says. "It is beyond our expectations. I like the fact that you have to read the memoirs. Two-dimensional pieces become 3-D."
As with all exhibits at Chinatown Boardroom, part of the proceeds will go to charity. 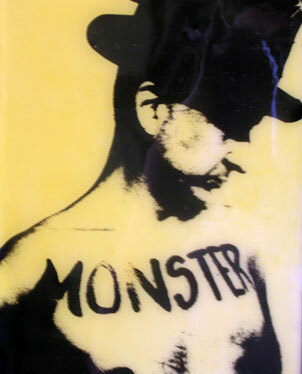 "Memoirs of a Monster" will benefit the Hawaii Dog Foundation, "for all the little monsters that make us happy." Chinatown Boardroom, 1160 Nuuanu Ave., is open 11 a.m. to 6 p.m. Tuesdays to Fridays and to 4 p.m. Saturdays. Call 585-7200. 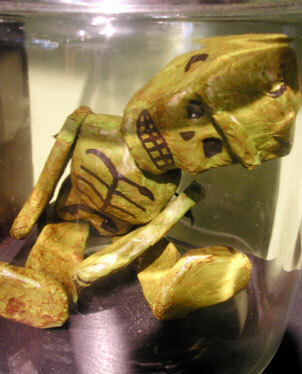 "Frankie Jr.," by Otto, shows a preserved corpse in a jar. 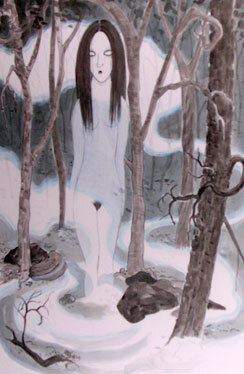 "Yuki-Onna's Memoir" by Maile Yawata. "Two of a Kind," by Damian Fulton.